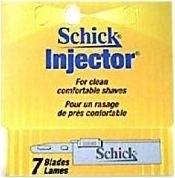 I purchased a schick injector replica from PAA and also got some schick B20 blades. However, the shaves have been really rough and feels like im raking my face. Ive tried various angles but still getting wayyyy too much blade feel. Is the supply razor any better? I prefer a nice stiff blade but not sure if its the razor thats not working for me. A bit disappointed to say the least. Try another blade. The first one might be bad. Ive tried two normal schick blades and two schick prolines. Still not a great shave at all. It kinda feels like the razor is “off” and the angle or blade holder isnt right. Yeah ive tried them as well. (01-31-2019, 01:44 AM)AaronW1983 Wrote: Yeah ive tried them as well. What is your angle of the razor blade (or the head)? I haven't used any razors like this but if my memory serves me right, I saw John The Mad Scientist of Shaving on youtube describing how flat you would press the single edge blades into the skin with the blades parallel to the skin and perpendicular to the beard. Kinda holding like a cartidge razor. Just feels like its dragging over my face. Ive tried various angles with no luck. With a cart the handle is really close to your face. With this kind of razor you hold it WAY farther away from your face. At least that is the way it has worked for me.